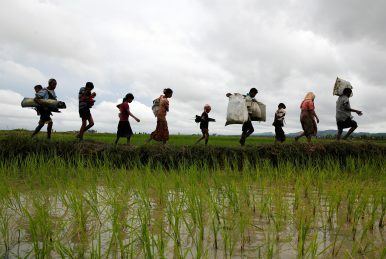 A group of Rohingya refugee people walk towards Bangladesh after crossing the Bangladesh-Myanmar border in Teknaf, Bangladesh, September 1, 2017. Teenagers executed with rifles. Babies drowned in rivers. Hundreds of thousands fleeing to squalid refugee camps in Bangladesh as their villages were set ablaze by soldiers and Buddhist militias. The horror stories streaming from the mouths of Rohingya Muslims fleeing Myanmar’s Rakhine State, as the country’s armed forces launch a brutal offensive in response to militant attacks on August 25, has resulted in widespread condemnation over the treatment of what many call the most persecuted minority on the planet. “The international community is saying it is a genocide. We also say it is a genocide,” Abul Hassan Mahmood Ali told reporters in Dhaka on September 10. Ethnic cleansing has never been recognized as an independent crime under international law, meaning there is no exact definition and has resulted in the term being used liberally by politicians and journalists. In popular discourse, ethnic cleansing is generally defined as using violence or terror to disperse a group in order to make an area ethnically homogeneous. Alicia de la Cour Venning, a researcher at the International State Crime Initiative (ISCI), who has studied the treatment of the Rohingya extensively, said a genocidal practice was being enacted in Myanmar and that genocide should be seen as a protracted process, rather than the sole focus being on acts of mass murder. “Our research reveals that the historic and current conditions of persecution against the Rohingya minority have developed into genocidal practice,” de la Cour Venning said. The Rohingya have been subject to stigmatization, harassment, isolation, and systematic weakening, the lawyer said, which are four of the six stages of genocide, according to a model devised by Daniel Feierstein, president of the International Association of Genocide Scholars. “Understanding genocide as a process, which takes place over years, even decades, allows us to identify genocidal processes in motion, enabling us to step in to prevent escalating violence, including mass killings, which is just one part of the genocidal process, which begins with stigmatization and dehumanization of the target group,” she said. “Until genocide is understood in this way, rather than solely as mass killings, which is just one component of the genocidal process, we will be unable to prevent this form of violence whilst in motion,” she said. Although the Rohingya have faced persecution for generations, many trace the source of the escalated oppression in recent decades back to a 1982 law that refused to recognize them as one of the 135 “national races” of Myanmar. This has only intensified in recent years as members of government have denied the existence of any ethnic group named “Rohingya,” referring to them as illegal “Bengali” immigrants. “Once we take into consideration the Myanmar government’s systematically oppressive policies and practices in regards to the Rohingya from the 1980s onwards, a very clear picture emerges of intent to eradicate this group,” she added. “The stages don’t always happen in such a clear cut, step by step, way and often repeat and overlap and what I was saying is that we have entered a ‘new’ phase since August,” MacManus said. Myanmar’s de-facto leader Aung San Suu Kyi — who was a darling of the West during her years under house arrest at the hands of the military junta — has come under hitherto unheard of international scrutiny for her silence over the atrocities being committed in Rakhine. Many have called for her Nobel Peace Prize to be revoked, claiming her refusal to speak out is giving the green light to the most heinous of crimes. “Aung San Suu Kyi will play a major role in blocking recognition of the Rohingya genocide. Diplomats worked for years to get her freed. They idealized her until she got a Nobel Peace Prize,” said Gregory Stanton, president of Genocide Watch. Despite increased calls from academics to label the atrocities in Rakhine as genocide, Phil Robertson, deputy Asia director of Human Rights Watch (HRW), said he did not believe there was enough evidence available to prove genocidal intent on the part of the military — a requirement under international law. “Not yet, but that doesn’t preclude that there might be at some point in the future, if more evidence can be collected about the intent of the Burmese government and Tatmadaw,” Robertson said, using the official name of the armed forces of Myanmar. In comparison, Robertson cited the mobilization of militias, the use of government radio and speeches of Rwandan leaders in 1994 as an example of an “abundantly clear” genocidal intent against the Tutsi minority. Robertson said he actually felt that efforts to tout the term genocide by some of the exiled Rohingya community and human rights activists could have had a detrimental effect on advocacy efforts. “It’s not that simple by a long shot, and there are some strong arguments that by over-claiming without adequate evidence, the exiled Rohingya community has hurt its credibility with precisely those governments that they need to get on board if international justice for the Rohingya is going to be obtained,” he said. However, HRW has accused the Myanmar authorities and Buddhist militias of committing crimes against humanity in a campaign of ethnic cleansing against the Rohingya in 2012, and Robertson accused the international community of having “no strong interest” in addressing accountability for those atrocities. The reluctance on the part of the international community to call it such was due to a belief that it would then require action, she argued, when in fact the Genocide Convention imposes no obligation for intervention to stop a genocide. Member states of the United Nations do, however, have an obligation through its endorsement of the “responsibility to protect,” a global political commitment which was agreed on at the 2005 World Summit to prevent genocide, war crimes, ethnic cleansing and crimes against humanity, Cronin-Furman pointed out. “Someday, it may be an international prosecutor’s job to decide whether to charge members of the Burmese military or civilian leadership with genocide. For now though, it doesn’t really matter whether they’re acting with genocidal intent,” she said. The Mad Monks of MyanmarSuu Kyi & the Contradictions of StateYaba: The Red Pills and the RohingyaMyanmar's Unhappy RebelsWhat Is the Tatmadaw’s Plan for the Rohingya?